A theme park that refused entry to a Sikh family for refusing to hand over a ceremonial dagger has revoked its ban on allowing the knives inside. 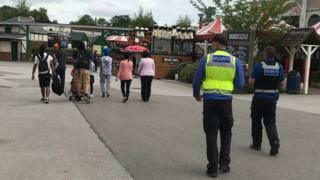 The family was celebrating their son's sixth birthday at Drayton Manor Theme Park in June but were turned away when an adult refused to remove his Kirpan, worn as a symbol of faith. The daggers were not allowed in the park for health and safety reasons. But the park said they are now allowed, although guidelines must be followed. The dagger, or sword, is one of five symbols initiated or baptised Sikhs wear. The family, from Coventry, was offered a replacement necklace which the adult refused. The park said at the time that an independent health and safety report confirmed wearing a sheathed dagger, or anything similar "posed a viable compromise to safety". But after discussions with the Sikh Council UK, the park said it had changed its rules. In a statement the park said: "As with any business we continually review and update our policies. "In this instance, through in-depth consultation with the Sikh Council, Drayton Manor Park has resolved to welcome Sikh visitors wearing Kirpans adhering to mutually agreed health and safety guidelines." Sikh Council UK said it had worked closely with the park and welcomed its "positive engagement". It added it hoped other visitor venues would now follow the example.